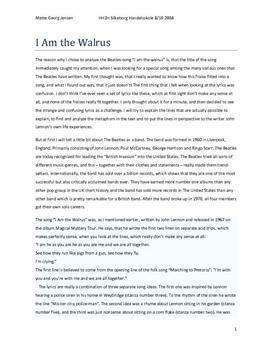 Analyse på engelsk av The Beatles' sang "I am the Walrus". Sangen er skrevet av John Lennon og i oppgaven får vi med oss omstendighetene rundt sangen samt en analyse av virkemidler og tematikk. The reason why I chose to analyze the Beatles-song “I am the walrus” is, that the title of the song immediately caught my attention, when I was looking for a special song among the many various ones that The Beatles have written.